Anyone who knows me will know that I have had an obsession for stamps and stamping for many years, as well as having a huge collection in my personal stash I am also lucky enough to have my own range which, as you can imagine, is the icing on the cake. I had spent many hours dreaming about having my own range one day so when it finally happened and I launched Downland Crafts branded stamps a couple of years ago I was beyond excited. It’s one thing having a passion for stamps and stamping but having other people like what you design and want to buy them is another. I am so lucky that from the get go all I got was positive feedback and we are now selling them before they’re even released! How’s that happen I hear you ask? Well as you no doubt know we have a Facebook group called #DownlandCrafters and I have started previewing them with our regular customers before they are shown on the website and our Facebook page and have even started taking pre-orders. The latest designs are Fairytale and Fantasy based so if you want a sneak peak just click to join our group. As well as designing stamps myself we also have the very talented Tanith (a.k.a. Elfie) who draws fabulous images for us when she’s not minding the group and page, when my ‘middle of nowhere’ broadband is misbehaving, or running her own business Tanith Handicrafts. If you follow us on social media you will no doubt know her well. As well as being an excellent head elf she’s also a very dear friend and I can’t imagine running Downland Crafts without her…and Mr DC of course. We have so many new designs in the pipeline for you and would love to see what you make with them so feel free to post in the group or on our page. 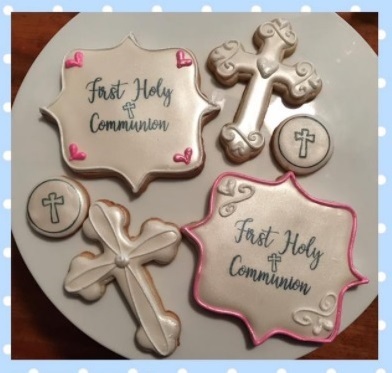 The picture featured at the top of this post is from one of our American customers who used our First Holy Communion Stamp Set with edible ink to make gorgeous, and I’m sure delicious, cookies. We are even starting a Sunday Showcase feature in #DownlandCrafters next week where you can share all sorts of card making, paper crafting, jewellery making and beading projects, or anything else you make for that matter, all we ask is that at least one product used in the picture you share was bought from us. We’ve also been asked to do project blog posts where we show you in more detail what you do with the stamps and other items we sell so we have taken that on board and have plans for card making projects in the very near future. If you write a card making blog and would like to feature our stamps then do please get in touch with us at info@downlandcrafts.ie we’d love to hear from you.